As most of our Galaxy Nexus LTE owners know, a test Jelly Bean build was found last night and released this morning for you all to enjoy. If you didn’t feel like factory imaging back to stock Android 4.0.4 (IMM76K), so that you could then update to IMM76Q and then eventually onto JRO03O (Android 4.1), you were much more patient than I. 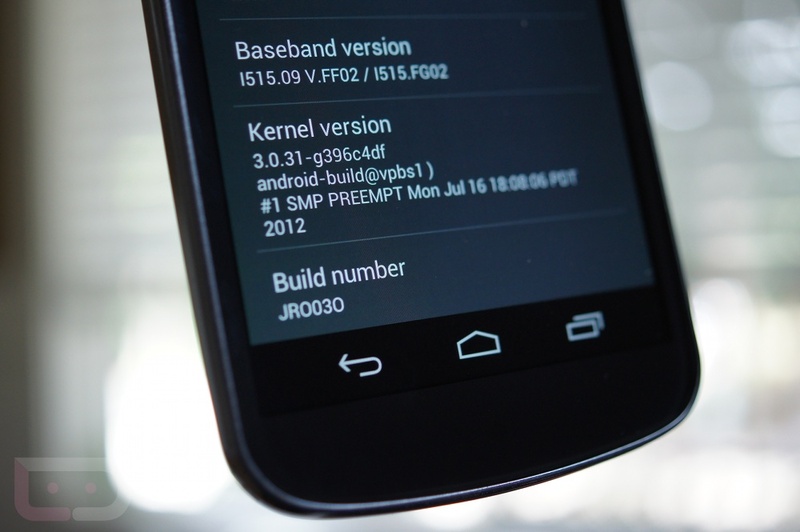 That patience has paid off, as a .zip that should take you onto JRO03O from any ROM has been released by @P3Droid. *If you only want the new radios from this Jelly Bean build, you can find them here. 1. Download the file from above onto your phone’s storage. 2. Reboot into recovery and make a backup. 3. You should probably wipe data and cache at this point. 4. Then “install zip from sdcard” and find the file you just downloaded. 5. Watch it install, reboot, and enjoy. If you run into any issues, be sure to let us know in the comments. And again, be sure to make a backup first. *The build is stock, but has been rooted.